The Xperia XZ1 Compact is a pretty decent smartphone that's been launched on the market not even one year ago. It packs flagship hardware in a very compact chassis, so it's aimed at consumers who aren't particularly attracted by devices with big displays. Unlike its bigger brother, the Xperia XZ1, the compact model has a much smaller 4.6-inch display with HD (720 x 1280 pixels) resolution, but the rest of the specs are similar with the exception of internal storage, which is just 32GB as opposed to 64GB. 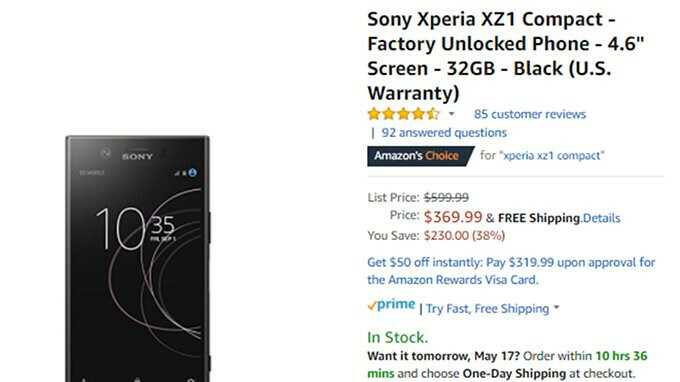 Well, if smaller, powerful smartphones are your thing, the Xperia XZ1 Compact is on sale for a fairly massive discount. Amazon and Best Buy offer the device for just $370, the lowest price we've seen to date. Although both retailers claim the phone's usual price is $600, the Xperia XZ1 Compact often sells for just $500. Even so, you'll still be able to save $130 if you get the phone while its discounted. There's one caveat though, as the Black color is the only Xperia XZ1 Compact model that benefits from such a large discount. The other two color versions – Pink and Silver, can be had for $400, so they're just $100 off. It's much more compact than the XZ2 Compact (6mm shorter, 1mm narrower). A great buy if you are into very compact smartphones. Yeah it's a great phone. Battery life and performance are both awesome! lol it worth 250 tops. Without fingerprint reader it doesn't worth even 260 USD. I had a Z3 Compact and absolutely loved it! SONY has disappointed me again and again since then, but not because they make bad phones, but because they no longer make GREAT phones. I would love another Sony Compact phone, but they need to do better in the design department, and make a slightly better bang for buck offering than they currently have. Either lower the price a bit, or provide a little more for the price you currently have.